Design of a Borehole Heat Exchanger system, based on a fixed energy demand profile. Design of a Borehole Heat Exchanger, based on a fixed BHE or budget size. 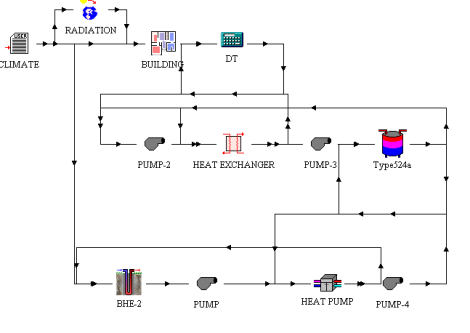 Dynamic design of a full plant, including heat pumps, hybrid options, circulation pump, buffer capacity and heat exchangers. A borehole heat exchanger design which is based on a fixed energy profile calculates the size of a borehole heat exchanger given the energy profile. A choice is made with regard to the required operating temperature limits and system efficiency. This design is based on a semi-numerical approach, which is the industry standard in BHE design. Depending on the project we can use one of several computer codes to implement the design (Earth Energy Designer, Ghlepro or GLD software). A full design of the BHE field is provided, taking into account the borehole construction (minimization of borehole thermal resistance), borehole field geometry and borehole spacing as well as the hydraulic design with respect to pump-pressure loss. Another possibility, e.g. used for hybrid systems, is to fix the size of the borehole heat exchanger and calculate the maximum amount of heating and cooling energy that can be exchanged with that system (optimizing for e.g. highest performance). 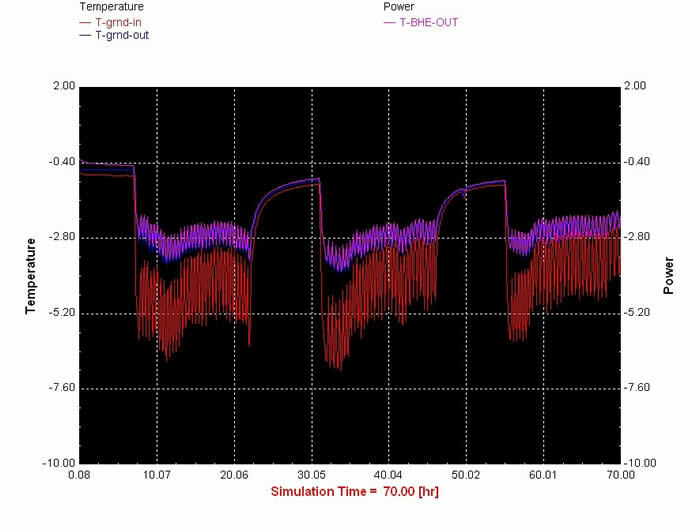 The temperatures are allowed to vary as a function of thermal load. In some instances the dynamical plant behaviour is of interest. This is especially the case for more complex hybrid systems, where the choice of using either the heat pump or the secondary systems under certain conditions is a matter of performance and setpoint optimization. Such an optimization can only be achieved with a fully dynamical model, by using Monte-Carlo simulations. The backbone for this type of analysis is TRNSYS (Transient Energy Simulation Tool). Using the same TRSNSYS tool, a detailed building energy simulation can be performed to calculate the actual building energy demands under variable conditions. The model takes into account climate, building envelope and internal mass, internal loads and other factors. The results can either be used as a load demand profile in the design calculations, or the building model can be coupled directly to BHE or plant models described above. The modelling will allow sensitivity analysis of those design parameters that affect energy usage or building comfort. To allow a heat pump to function with a ground heat exchanger, it is necessary to establish at least the number, depth (total length of ground coupling) and distance between individual heat exchangers of the ground heat exchanger. Based on, amongst others, geological condition, the energy demand and the required temperature level (in view of the COP) this design can be made. Several methods to perform these calculations are available. This is currently the most widely adopted approach. This method uses special functions (G-functions) that describe the interaction between heat exchangers for a large number of configurations. These G-functions have been calculated using a sophisticated numerical model. Using an analytical approach together with these G-functions makes it possible to accurately design ground source (borehole) heat exchangers. Several implementations exist, differing mainly in their treatment of borehole thermal resistance, energy profile and heat pump definition. A numerical model solves a set of equations (in our case partial differential equations) using mathematical solvers. To be able to calculate a solution the space and time component of the system is divided into small discrete steps (the discretisation), the equations are subsequently solved for the model-grid. Methods that are often used include Finite Elements (FEM) and Finite Differences (FDM). These models are used mainly when no semi-analtical solution is possible (horizontal systems, energy piles) or when ground water flow or convection have a significant effect on the thermal behaviour.